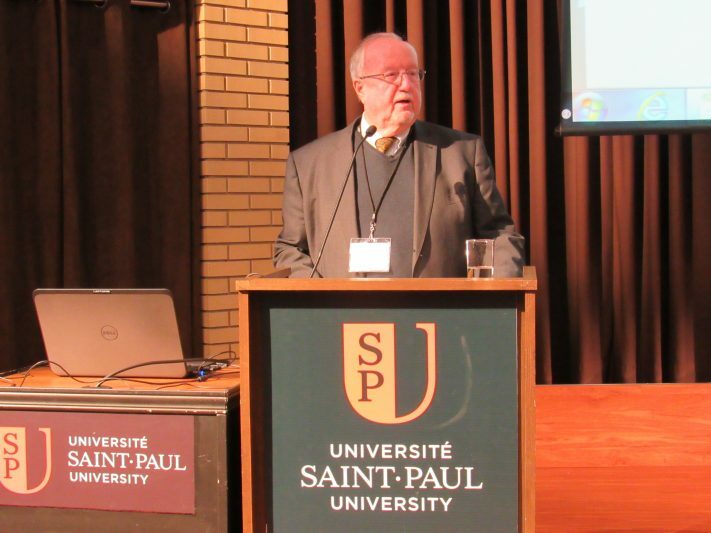 Ottawa’s Saint Paul University was the site of the opening day of a conference organised on the sixtieth anniversary of the arrival of the vast majority of Hungarian refugees to Canada and in the year of the 150th anniversary of Canadian confederation. Mike Molloy, President of the Canadian Immigration Historical Society, opened the conference by reading the greetings from Ahmed Hussen, the Minister of Immigration, Refugees and Citizenship. The minister highlighted that the conference helps in “promoting the history behind Canada’s diversity.” Mr. Molloy also added that “in a world where populism, xenophobia and anti-immigrant tendencies seem to be on the rise,” the message of such a conference is especially relevant. Agatha Schwartz, professor at the University of Ottawa in the Department of Foreign Languages and Literatures, and Judy Young-Drache, President of the Canada-Hungary Educational Foundation, both conference organizers, explained that the idea for such a conference developed over the course of the past two years and it was agreed that the event should be broader in scope than only looking at the arrival of Hungarian refugees. 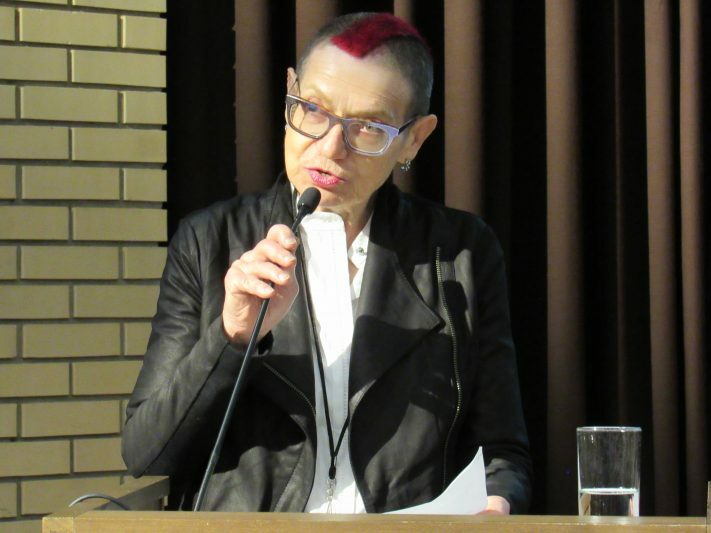 Agatha Schwartz. Photo: C. Adam. Ms. Young-Drache shared greetings from Catherine McKenna, the MP for Ottawa-Centre and Minister of Environment, who referred to the conference as an opportunity for education and advocacy. “The Government of Canada understands that our country was built on welcoming others,” noted Ms. McKenna. Ottawa Mayor, Jim Watson, also sent his greetings and best wishes for the conference. The Embassy of Germany in Canada was represented at Marianne von Blomberg at the conference, noting: “We need to learn about more about the phenomenon of flight in general.” Over 1.3 million asylum seekers arrived in Germany and the country began to tackle a variety of questions, including speeding up the process, as well as questions of accommodation and integration into a culture that is very foreign to many of the arrivals. Also present at the conference Mark O’Neill, President and CEO of the Crown corporation that operates the Canadian Museum of History and the Canadian War Museum. With the UNHCR represented at the conference by Michael Casasola, we heard that there are currently more than 22.5 million refugees and the situation in South Sudan, the Central African Republican and the Rohingya in Bangladesh continue to pose a major challenge. Economic, legal, cultural and social integration are four of the central considerations when it comes to settling refugees. Syrian refugees, we heard, have developed a tremendous attachment to Canada. As well, refugee children have a higher rate of participation at Canadian universities than Canadian-born children. 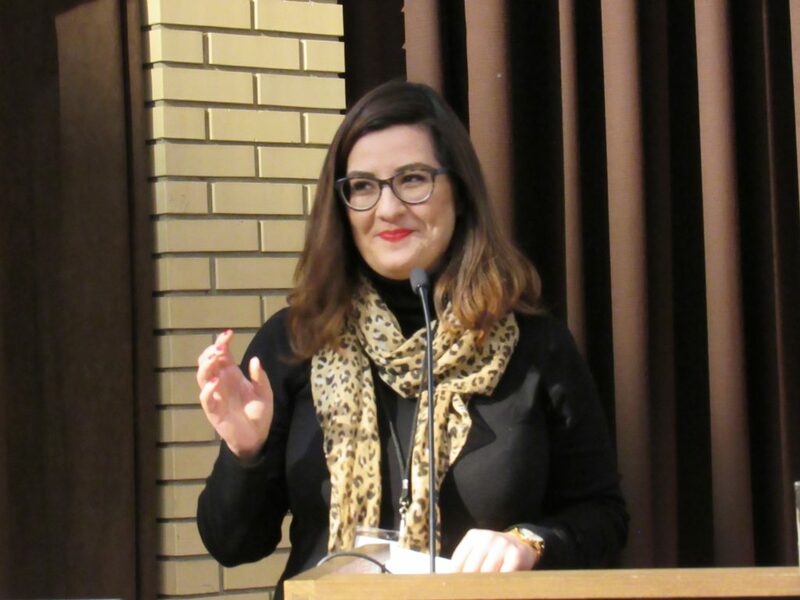 The first session explored the creative expressions of migration, displacement and multiple identities and was chaired by the former Director of the Portrait Gallery of Canada, Lilly Koltun, herself a descendent of immigrants. 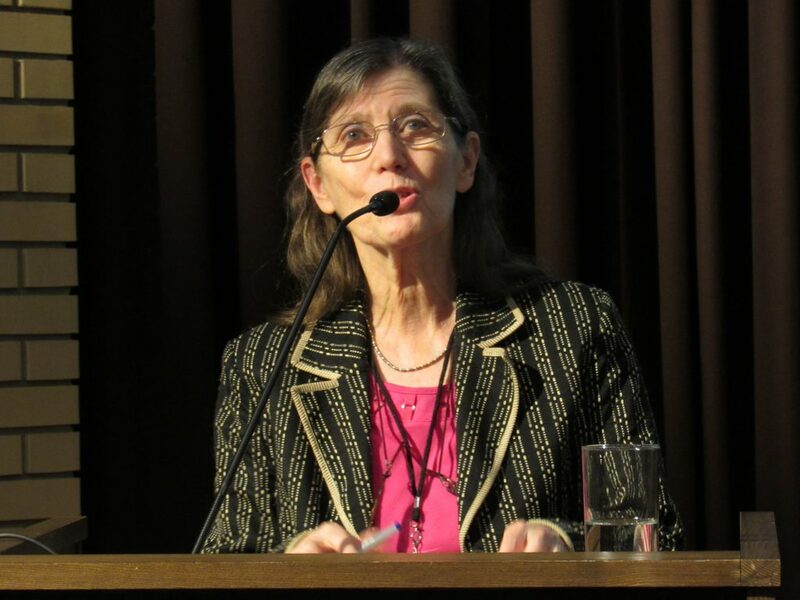 Lilly Koltun. Photo: C. Adam. Montreal-based photographer Amina Jalabi arrived to Canada from Syria 23 years ago. She felt a connection to the refugees arriving in 2016. 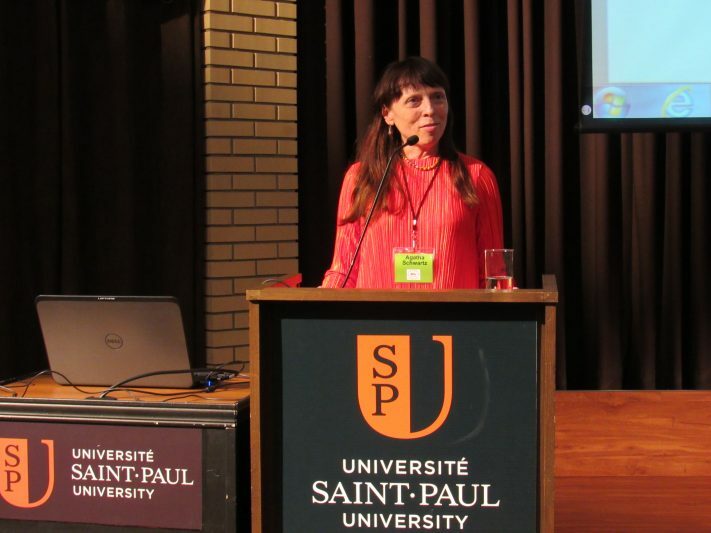 Among the photographs Ms. Jalabi presented of the refugee experience was the terrible attack against refugees by Hungarian journalist Petra László–a camerawoman who kicked migrants near Röszke, Hungary, who were fleeing from police. 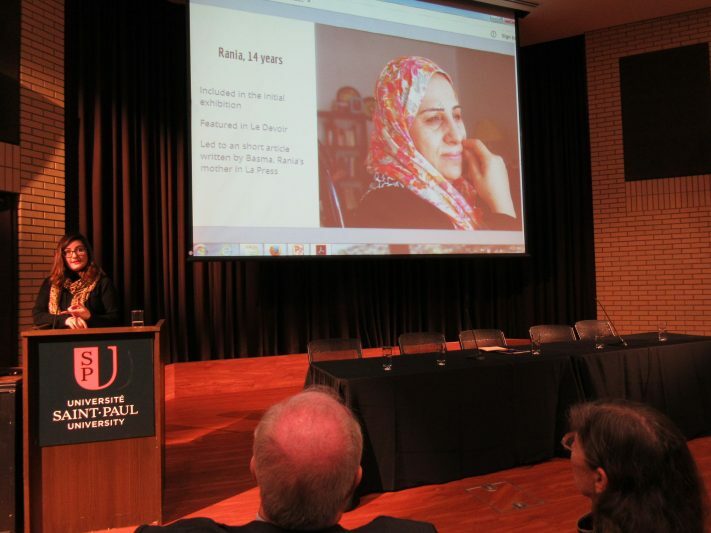 Ms. Jalabi’s main contribution, however, was the development of a media project with and on the refugee experience. This project enabled participants to record their integration journey and their new life in Canada, as well as promote critical thinking, self-knowledge and self-awareness through guided discussion, whilst challenging the “typical view” of what a refugee is. Refugees are portrayed not only as vulnerable and in need, but as artists, photographers, teachers and as as Montrealers in general. Amina Jalabi. Photo: C. Adam. Amina Jalabi presenting photography pertaining to refugees. Photo: C. Adam. The presentation of refugee photography was followed by theatre. David DeGrow, by exploring the development of experimental theatre in Toronto in light of American draft evaders arriving to Canada during the Vietnam War, showed how refugee movements can play a critical role in developing specific industries and artistic sectors in the host country. In particular, Mr. DeGrow noted, the presence of American actors brought the American political reality into the Toronto consciousness. Draft evaders were central to the counter-cultural scene in Toronto, especially around Rochdale College, an alternative education centre and cooperative residence established in 1968, run entirely by students. Mr. DeGrow adds that the theatre community in Toronto today is much larger than it was in a past. As such, if Americans immigrate to Canada today, they would face much more competition and a more developed live arts scene. If we see such a mass migration coming, will we act like the community did in the sixties and seventies, building networks and allowing refugee artists make the fullest contribution possible? This is the question that Mr. DeGrow used to close his presentation. David DeGrow. Photo: C. Adam. From a discussion of the experimental theatre scene in Toronto, we turned to an exploration of the theme of displacement in post-1989 Hungarian film. Gábor Gelencsér, of Eötvös Loránd University in Budapest, looked at how the concept of “going abroad” appeared in post regime change films. Political motivation was replaced by economic motivation when characters in films are depicted as leaving Hungary. Loss of orientation and returning home are regular themes during the nineties all the way to contemporary Hungarian films. There is even a category of “return films” in Hungary today and many of these films explore marginalisation in the West and the subsequent return to the East. This is generally a return after an unsuccessful immigrant journey to the West. We can see this as a renouncement of post-Soviet colonization and also a rejection of Europeanization in the former Eastern bloc. Péter Vajda’s Voila la liberté! and the film Je t’aime, as well as Moscow Square by Ferenc Török, all draw attention to the collapse of the Iron Curtain and, quoting Miklós Sághy, how people “face the tangible reality of the West that once lived in their imagination.” The protagonist Hungarian migrant experiences alienation and “blurred chaos” in the West. Gábor Gelencsér. Photo: C. Adam. 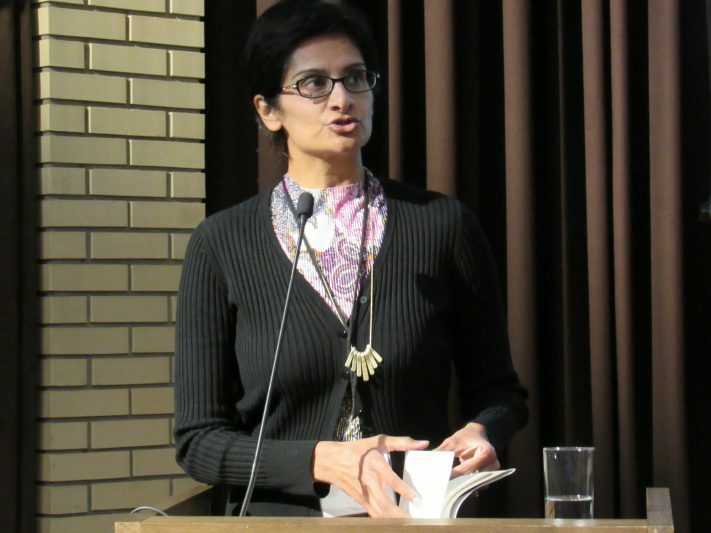 Kitchener-based author Tasneem Jamal ended the first day of Flight to Freedom with a reading. Born in Uganda, Ms. Jamal immigrated to Canada in 1975. The author read a moving passage from her book, Where the Air is Sweet. The book is built on Ms. Jamal’s family story, when the author was not quite four years. Ms. Jamal spoke of the importance of giving people who lived the refugee experience a voice, to share the emotional impact in particular. Tasneem Jamal. Photo: C. Adam. 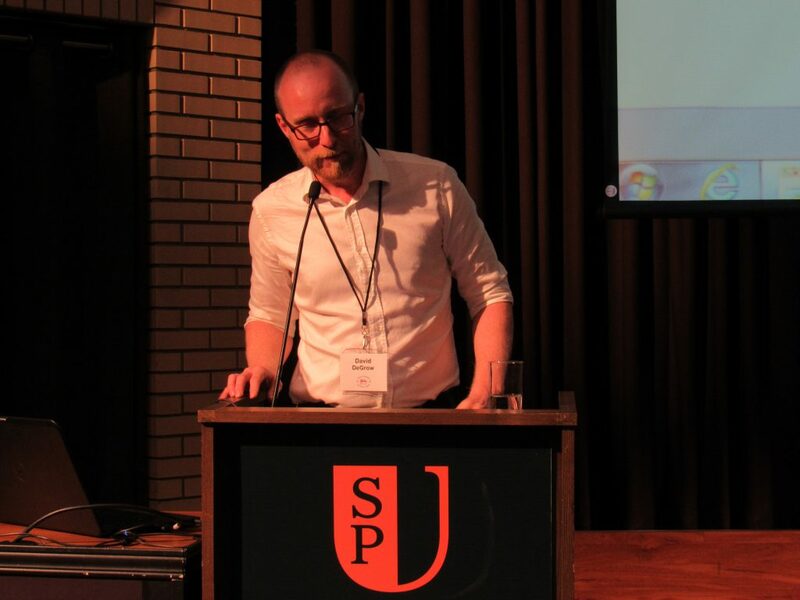 The first day of our conference did what perhaps few symposiums on such subjects do: rather than beginning with public policy and political history and ending with art, it began the exploration of the refugee experience through artistic expression. Author: Christopher Adam Christopher Adam received a B.A. in history from Concordia University, an M.A. in East/Central European and Russian-Area Studies from Carleton University and a PhD in history from the University of Ottawa. 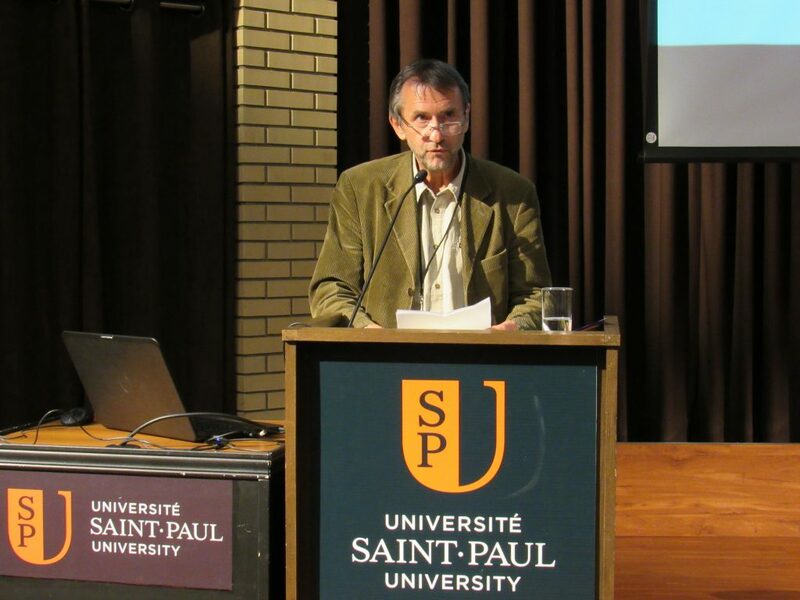 His research focuses on the history of the Hungarian diaspora during the postwar period. 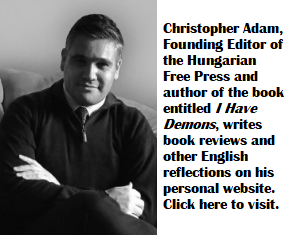 Christopher is the founding editor of the Hungarian Free Press, as well as the founder and editor-in-chief of the Kanadai Magyar Hírlap Hungarian-language paper, which won Hungary's 2015 Free Press (Szabad Sajtó) Award. Christopher resides in Ottawa, Canada. Bravo to the conference organizers for placing the 60th anniversary of the 1957 Hungarian immigration to Canada in the broader context of immigration attitudes and policy in Canada and in Orban’s Hungary today. I won’t state all the obvious, just that whereas some very recent Hungarian immigrants to Canada may have elected to “return to the East” because of “marginalisation in the West,” refugees from the East today do not have that option (and neither did the Hungarian refugees of 1957). But as Orban presses on toward making Hungary a xenophobic, mafia-police state, that option may well vanish, and then Hungarians will discover what (and where) marginalization really is. I personally find this line of argument to be sickening! The Hungarian migration event was something closer to the Huron taking in some Mohawks. The current migrant influx from ME-Africa into Europe is more like the colonization of North America by the Europeans. The main ingredient is in fact the demographic overflow. Just consider for instance the country of Niger. In 1990, it had a population of less than 8 million. Today it is about 18-20 million, and by 2050, it is projected to reach about 65 million, same as France. The 1.5 billion inhabitants of ME-Africa are set to become 3 billion by 2050. It is population overflow just like it happened in Europe hundreds of years ago, and the progressives of today, including some Hungarian expats seem to think that the place it should be overflowing into is Europe, with its native population going through a period of culturally-induced demographic decline. In other words, they wish to see the dozens of native and distinct cultures of Europe erased though population replacement, just like it happened with the natives in North America. Not much difference between the progressives of today, and the worshipers of progress in the 1800’s who saw the elimination of native cultures from their land and way of life as “progress”. Same mindset, same goal! It is criminal! Subscribe! Hungarian Free Press delivered by email!